Katarzyna Korytowska has finished two, four year schools both located in her native country Poland, University of Poznan and Poznan Academy of Art. She has studied both fine arts and architecture, specializing in design of the interiors. Because of her rich background in two fields, today she is able to combine both and create art that enhances the look and functionality of living spaces. Her latest collection is inspired by natural elements. She magnifies them with wonderful attention to detail and texture giving them incredible lace-like impression. 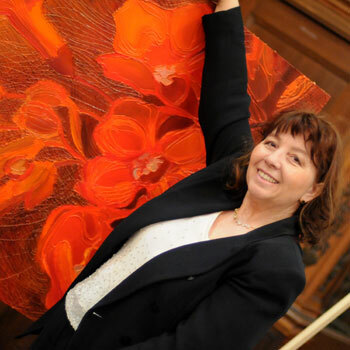 With these oil paintings she is capable of filling interiors with striking warmth and energy. Please contact her for professional resume.